If you've read my previous travel posts, you will realise that most of my travelogues are posted according to places. It is my preferred writing style as I am able to share more pictures and go in detail about my various experiences at that particular place. However, such postings are too time-consuming! Judging from my current schedule, I'd probably need a few years to complete all the cities and attractions that are on queue. Many have been "complaining" to me that they've been collecting dust while waiting for the travel posts I never had time to complete. Therefore, I will kick off such Travel Guides to provide you guys with snippets of what I did and what you can expect. I will return to my usual magnified post style when I find the time to! So anyway, my Birthday Trip in September last year was to Hua Hin, a seaside resort city in Thailand little Singaporeans have heard about. A friend recommended this place to me previously, but I always lucked out on the chance to go for a holiday in the Land of Smiles. I paid almost SGD$400 per person for round tickets on AirAsia + additional 2 nights stay at W Hotel Bangkok. 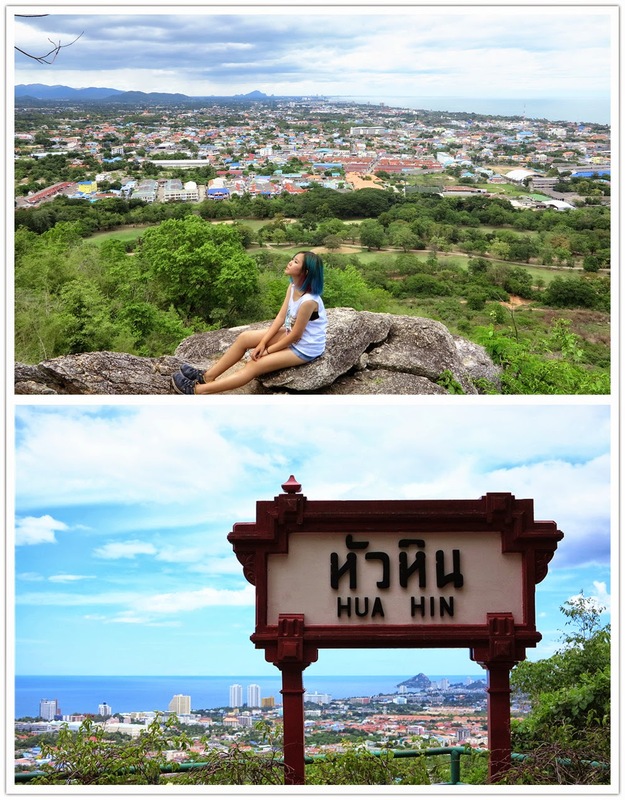 What I love about Hua Hin - it's not as crowded as Bangkok! 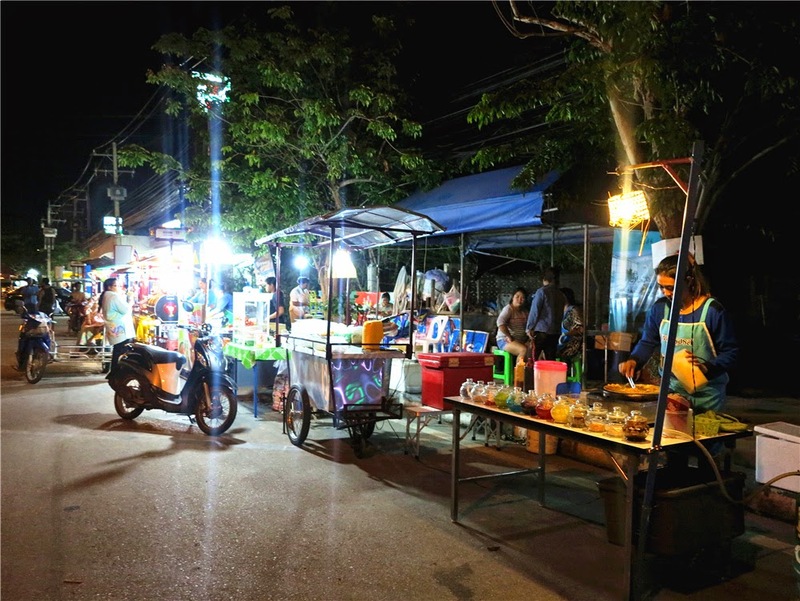 Now you know why the Thai locals flock here for a breather during weekend getaways. As mentioned in that post, I randomly picked a taxi driver from a line of them and hopped into the cab. My driver, Mr Nu, offered his driving services for my trip, and that was how he became my personal driver for the 2 days I was in Hua Hin. This is the hotel I won 2 days stay at! IT WAS WAY BETTER THAN EXPECTED!? Taxi fare from the drop off location to Amari costed ฿120? The ride took about 5~10 minutes. Everything about the hotel was too beautiful! Didn't expect it to be huge. Furthermore, I scored the pool view room with a balcony overlooking the resort! The place was clean, spacious, well equipped and modern. My room number was 2506. I managed to catch a glimpse of the sea from my room! And omg, don't get me started with the vast buffet selection for breakfast! The staff were nothing but warm, helpful and friendly. I bugged them with quite a bit of requests, and they were professional about it. The only downside to this place is that it's not exactly centrally located? You'll definitely need some sort of transport to shuttle you around. 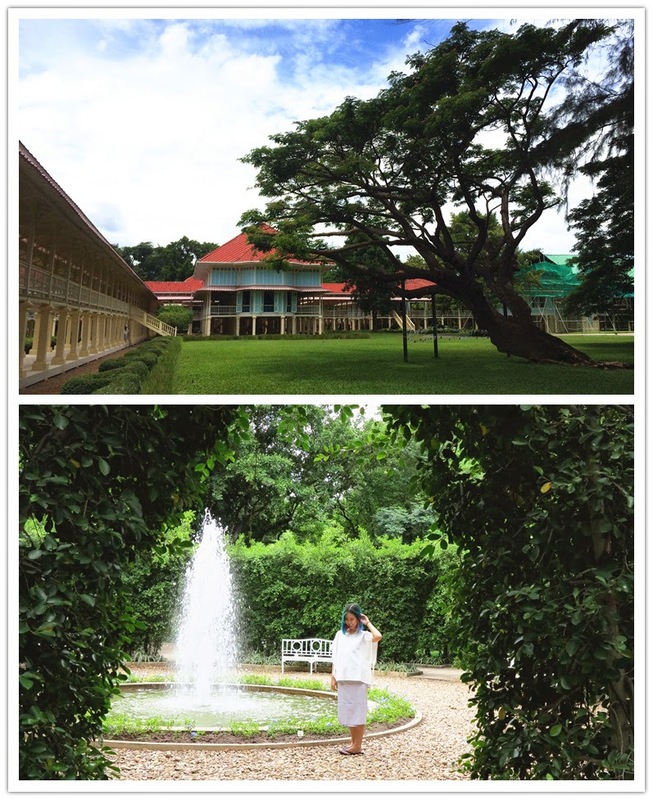 Also know as the Palace of Hope and Love, this was my first stop in Hua Hin. The palace is right next to a beach! I was told that it used to be the summer seaside palace built by their King Rama VI as a getaway location. Entrance fees are as follows: ฿30 for park, another ฿30 for palace. There was quite a distance from the entrance to the palace, therefore you might want to consider renting a bicycle. A tip before you visit: there are strict dress restrictions, remember to dress appropriately. Since I went in a sleeveless shirt and shorts, I had to pay additional ฿80 (?) to rent a blouse and sarong. Inside, I enjoyed the tranquil of the place. The main "palace" was actually standing on large, wooden pavilions. You'll be required to be barefooted to enter. The passageways were open-air concept, therefore it was windy all thanks to the sea breeze. Perfect to take a stroll! Downside to the "palace" - photography was not allowed! I tried to ninja my way with my mobile camera, but got caught. Sorry FBI, looks like I won't be able to work for y'all. :( Also, most of the descriptions were in Thai, thus I barely understood anything. Furthermore, there were ongoing constructions during my time of visit and many places were off limits. I got to say though - for a palace completed in 1924, it was pretty well-preserved! 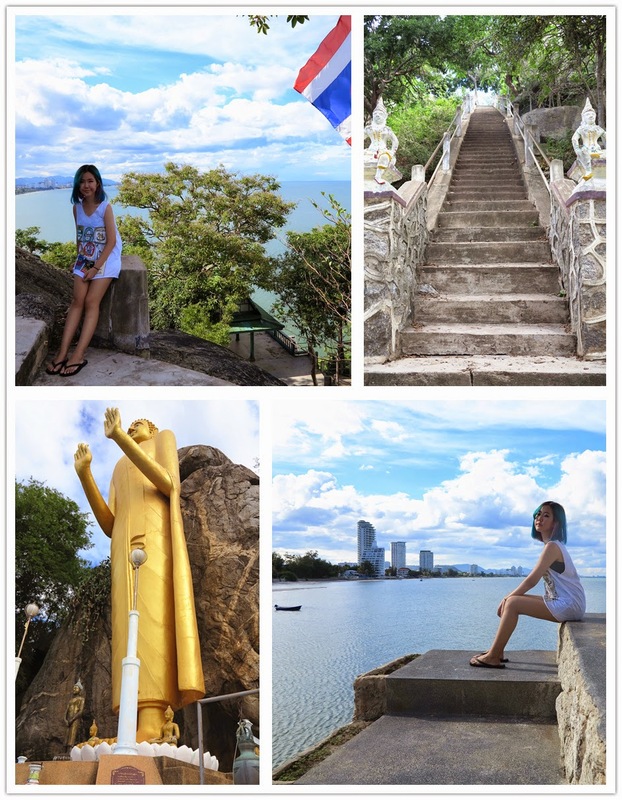 This attraction is definitely worth a visit if you want an AMAZING panoramic view of Hua Hin city. If I remember correctly, I think entrance is free!? There were different viewing points scattered throughout the enormous park, but I only went to 2. Be careful as there are sightings of monkeys here and there. Risking my life for a photo - I sat at the edge of the rock to capture the photo below! OMG I FROZE IN THE SAME POSITION FOR THE ENTIRE TIME, SO AFRAID THAT I WOULD FALL OFF THE CLIFF!? But dang, did the photos turn out good. Thank you all the Gods there are in the world for blessing my safety! My driver had to drop me somewhere further off from the entrance as the road was blocked. Had to walk through a restaurant heading towards the beach before I saw the banner and heaved a sigh of relief - I was at the right place. I learnt that Khao Takiab means Chopstick Hill. You will see this standing Buddha, said to ward off evil spirits from the sea. Climbed up what seemed like endlessssssssss stairs, but was greeted with a scenic sea view! I assume I was only halfway to the temple though, as I spotted another long flight of stairs far away, which I refused to take a step on due to lack of stamina and time. Just like any other beach, but they offered pony rides! Initially, I didn't want to ride on the pony and rejected every offer coming my way. However, the people taking care of the ponies were rather pushy! Since there was nothing much to do except to lay around, I went for it. They charge according to time, and I paid ฿350 for a 30 minutes ride. Well, it's not every day I get to do this, so. There're a couple of bars and restaurants by the beach as well. They also have beach chairs and umbrellas for rent if you need. I wouldn't recommend actually going to the sea for water activities though... The water wasn't as clear as expected. 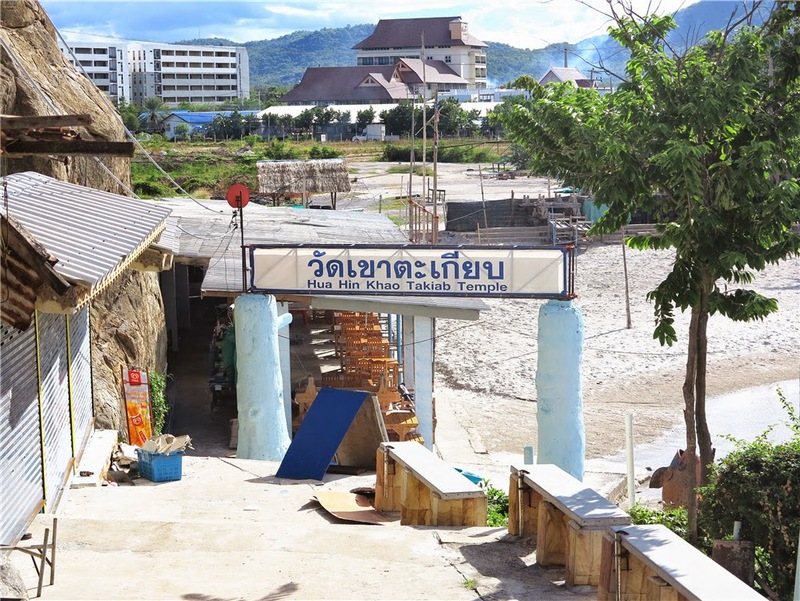 One way to reach Hua Hin is by train. I had plans of taking train rides, either to or from Bangkok! Unfortunately, the train schedule did not match mine and the duration was a tad too long. Nonetheless, I had a mini "photoshoot" by the rail tracks before the train arrived as the backdrop was too pretty! This place wasn't planned in the itinerary, but my day ended earlier than expected so the driver drove me over shortly before they closed for the day. 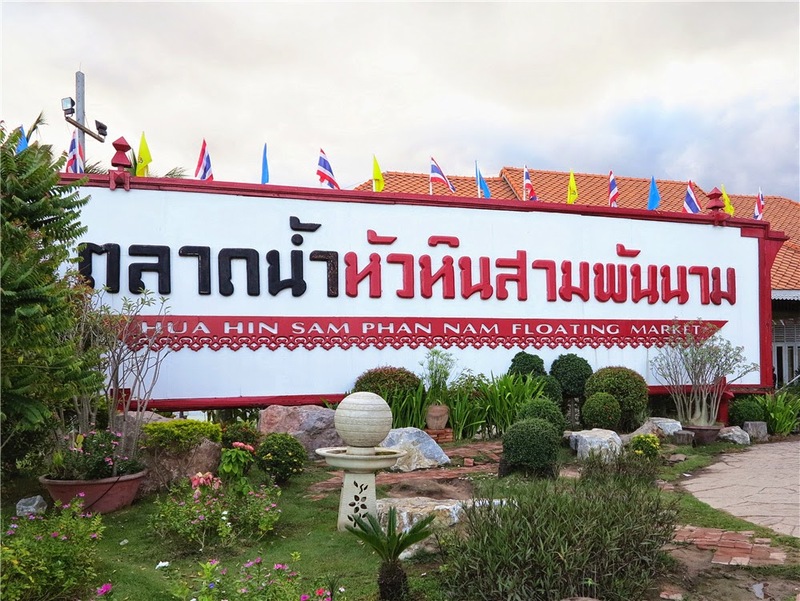 This is the biggest floating market in Hua Hin! 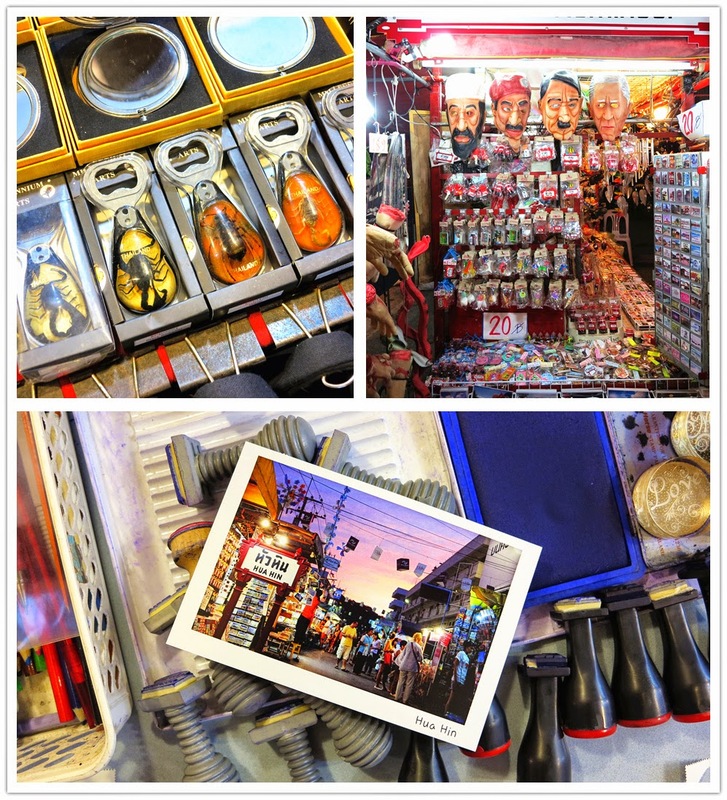 I have no idea why they call it a floating market though... 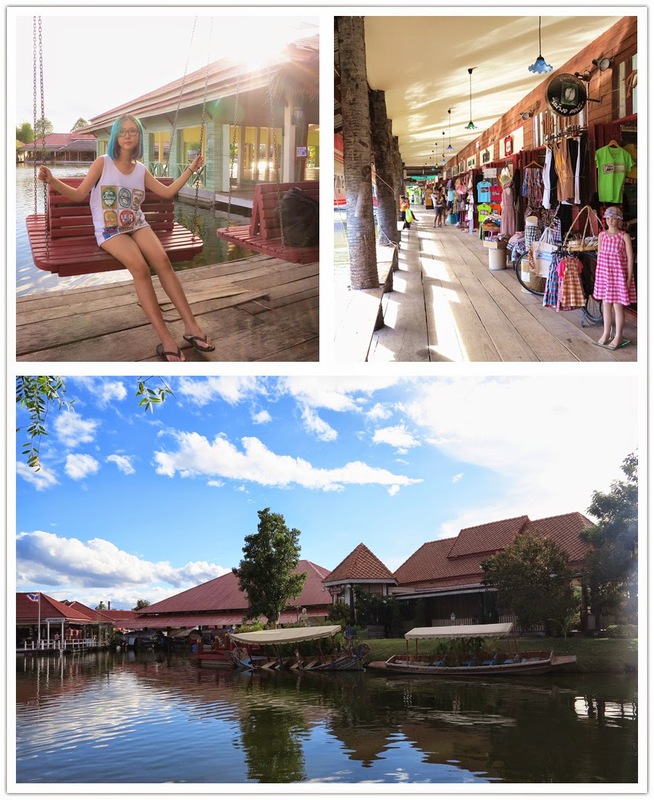 The shops surround a pond and there're no floating market vendors like what you see in Bangkok. I think tourists have to pay entrance fees, but somehow I managed to escape that. Probably the only reason to visit is for the food. 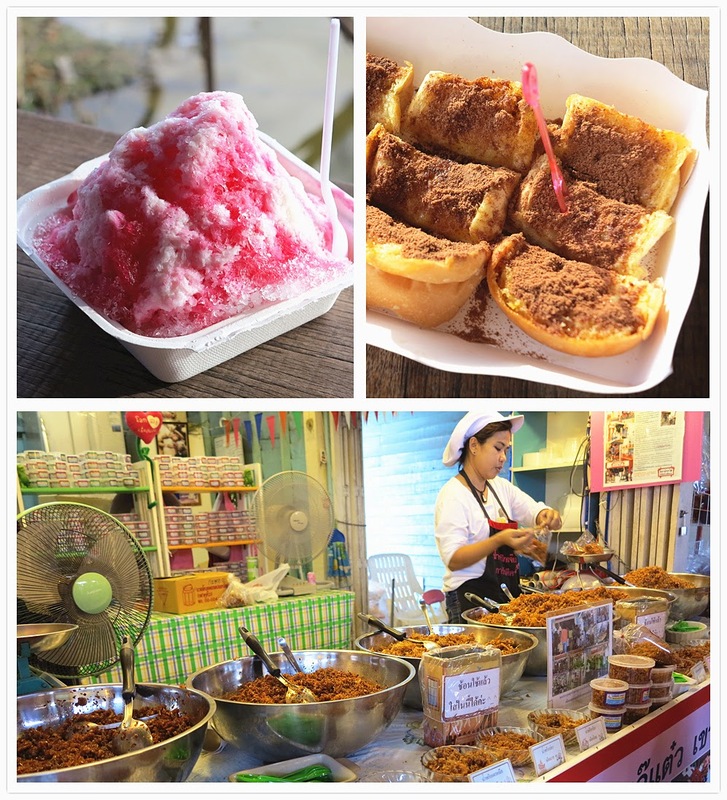 They served this shaved ice dessert drizzled in Thai sweetened syrup and bread with milo toppings! Not bad, not bad at all. I also bought cupcakes from another store. 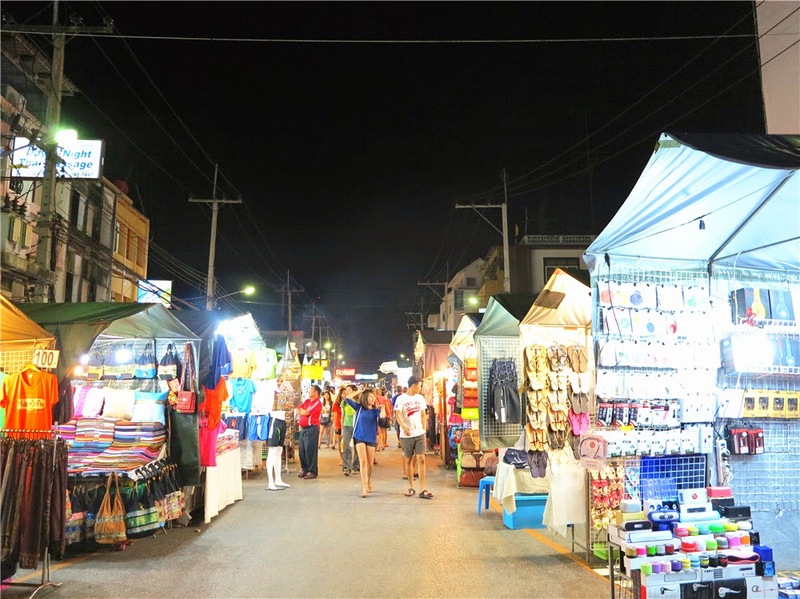 A must-visit in Hua Hin, the open air bazaar was lively and bustling. Fantastic place to buy gifts with the variety of products available, and to give local food a try. Do yourself a favour and try the round coconut dessert! Do have your dinner here if you can! You cannot leave Thailand without trying their seafood. Portions are bigger and cheaper compared to Singapore. Costed ฿1270 for a 700g lobster + fried rice with crab meat + coconut juice! There were a few similar stores selling seafood, but I settled for the yellow one somewhere in the middle. 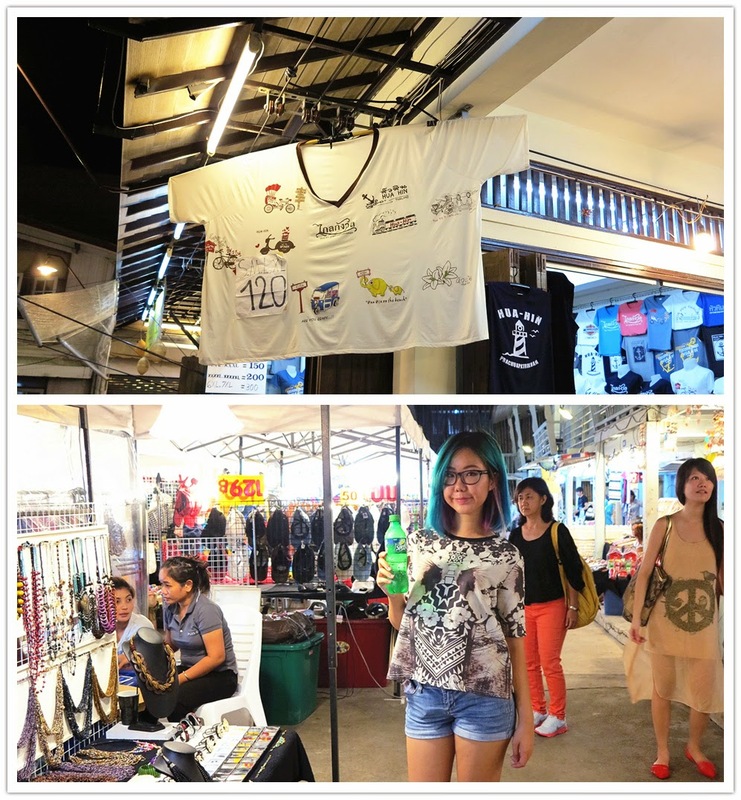 Adjoined to the Hua Hin Market, the atmosphere was a complete opposite. I preferred shopping here actually, as the items offered were more unique in comparison. I wonder how many times of XL that shirt size is. 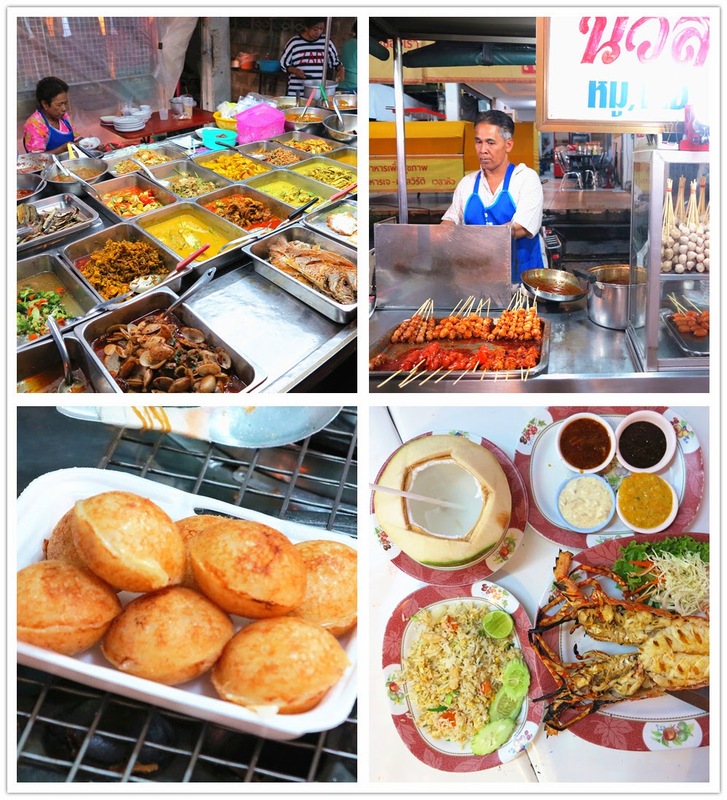 While not the most hygienic, give Hua Hin's street food a try if you have a strong stomach. I wandered around my hotel area looking for restaurants, but they did not appeal much. 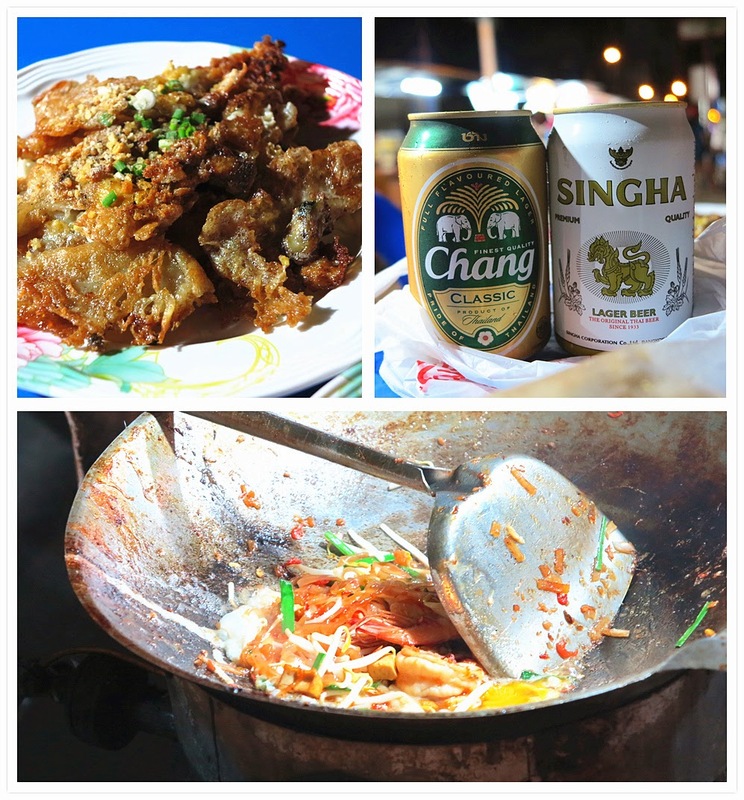 Was excited when I spotted food vendors by the streets as I have yet to try any at that point during my trip yet! The food was yummy, but I woke up with a horrible stomach ache, sigh. Unfortunately, I did not get the names of the dishes I'd tried. And how can we forget - when in Thailand, drink their beer! Bought mine at the convenience store nearby as I had no confidence in drinking water offered by the roadside stalls. If you've visited the places I'd missed out on this trip, let me know! I would love to hear you share your stories. Thanks for sharing. 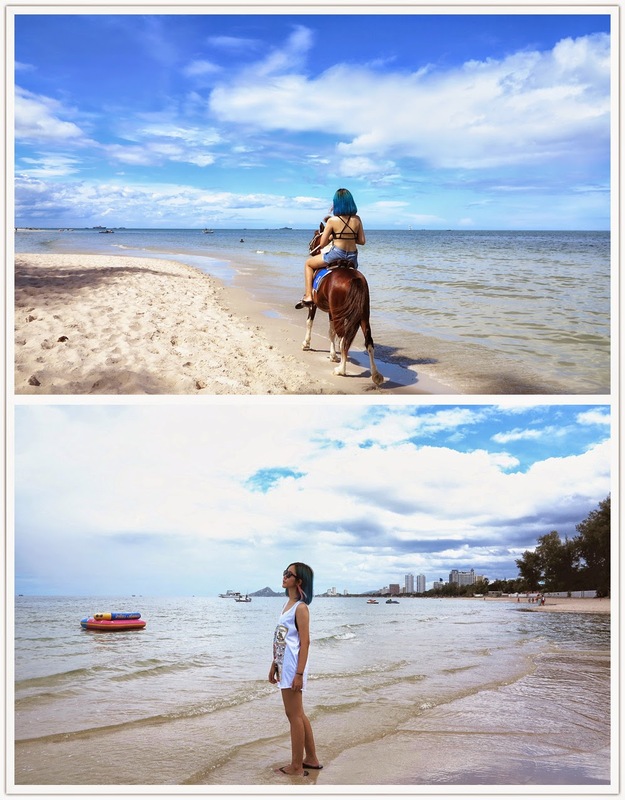 Just happen I'm going Hua Hin this July, bringing my parents too. Is this place suitable for elderly? Hey, thanks for leaving a comment. In my opinion, Hua Hin is not as developed with technology as Singapore, therefore it might pose quite a bit of problem for elderly. I remember having to walk a lot & climbed many steps (some were quite steep) while I was there. Of course, there are places you don't have to climb or walk much like at the railway and the markets. If they think they can take it, I say go for it though pace definitely has to be slowed down. Hope this helps! Came across your blog while researching for Hua Hin that our family is going to go. Could I ask regarding the taxi fees and how much do you have to pay for the whole of the 2.5 trip? Do you also have the contact? Hi. Do you have the email of the driver? Hi! My driver doesn't have email, only telephone number and LINE ID. But I think I have his friend's name card somewhere with an email address. That I'll have to check again! Can I have his telephone number pls? Hello, great post! Would like to know how was the weather when u went there? I am planning a trip there this September but google told me that Sept is a raining month. Not sure if its the best time to go there. Hi, do u still have the contact of the driver? greatly appreciate if u don't mind to share me the driver contact as i going to bangkok by end of the year.. thanks lots. 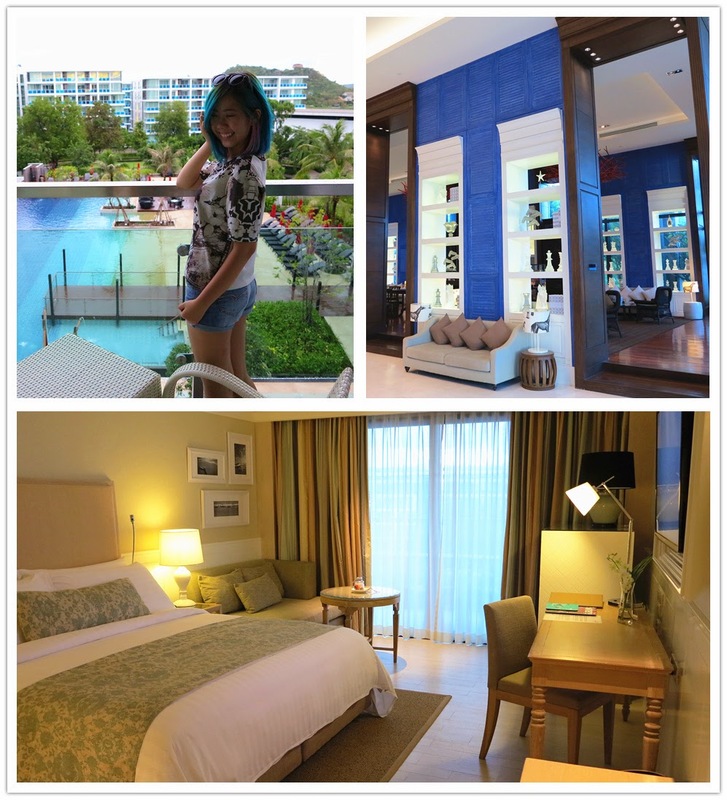 Hi, thanks for sharing your huahin travel experience. Do you happen to spot any other lower range hotel with good location? And you book your driver from bkk to huahin? Need to provide accommodation for him? And how much? Thanks in advance. Hello! :) Hmmm personally, yes, I feel that 7-9 days is rather long! 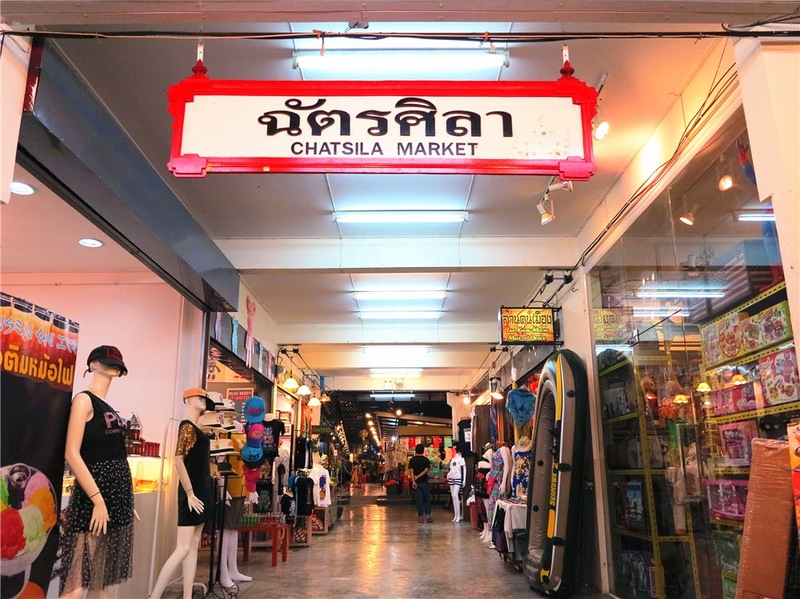 Unless you want to just relax your days away, I would recommend you include nearby places like cha am into your itinerary. Enjoy your trip! Do you also have the contact of the driver? Hi hi can I the number the driver in hua hin. Going next month to hua hin. Hi You dont mind to share the taxi contact? Hi you dont mind to share the contact of the taxi driver? f you have the taxi driver number? 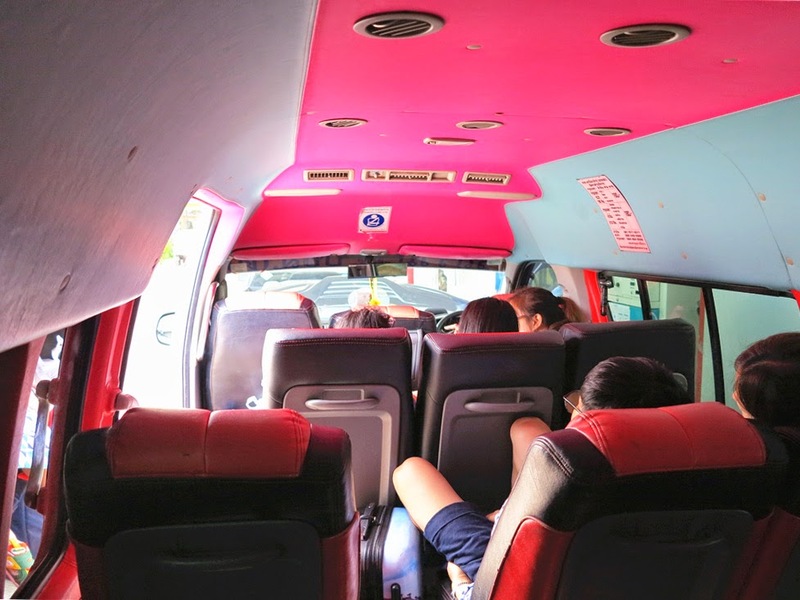 I hope that the driver could help me when I'm travelling in Hua Hin. could help thankyou! I m planning a trip from Bkk to Hua Hin about 2.5 days. Need a driver to pick me and husband from Bkk to Hua Hin alight me and the 2nd day pick us from Hua Hin hotel for a day trip and pick us on the 3rd half day to send us back to Bkk airport Don Maeung. Hi, great post and recommendations. Didnt know there is such a place near BKK. 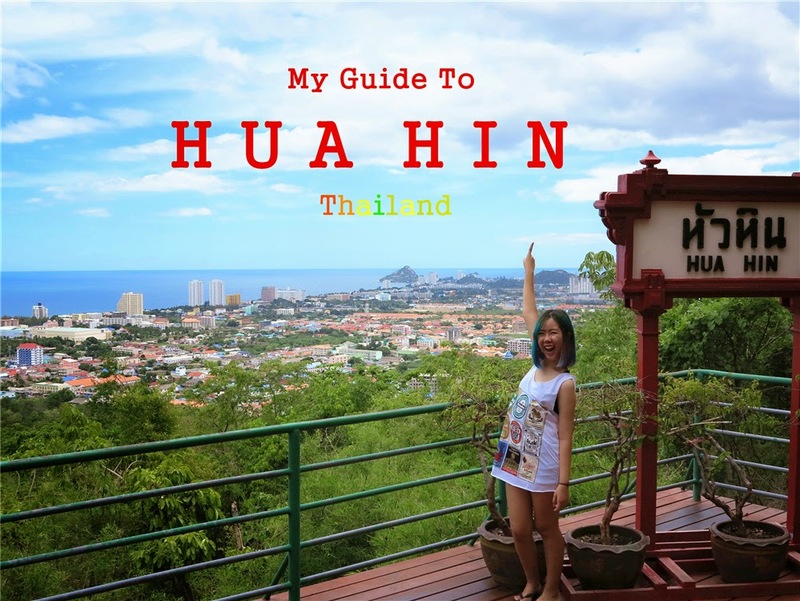 My family of 7 has planned to go visit Hua Hin after knowing so much from your post. But one of them is a senior over 80 yrs old and walking around would really be quite challanging. Therefore I wounder is there a taxi that could take 7 pax to travel around. It would be great if you could pass me the contacts of the taxi driver for me to make enquires? My email is otouto88@gmail.com. You dont mind to share the taxi contact with me ? Hi, may I hv the contact number? Thanks. my email address is at hanseechong@hotmail.com. Thanks. May I have the contact of the driver? My email is clwm_87@yahoo.com. Can i have the driver contact? Can I have the driver contact too ? My email is whitegal87@gmail.com Thank you ! May I have the driver contact? Can i have Mr Nu's contact? Hi, Thank you for sharing. Can you please send me the contact for the driver? Thank you. Hi, may I hv the contact number? Thanks. my email address is at florence_chf@hotmail.com. Thanks. Can you send me the driver contact. My email is julie889@hotmail.com. Thanks in advance. Hi, can I have the driver contact. My email is julie889@gmail.com. Thank you. Hi, thanks for sharing. Came across here while researching for Hua Hin Driver. Do you mind if you send me the information of the driver as well? Thank you. Can I have the driver LINE id or phone number or email? HI, can you share with me your driver contact in Bangkok? Hi, May I have the driver's contact? Thks in advance. Hi, may i have the contact and email of the driver you had in Hua Hin? My email is jolenelim90@hotmail.com. Thank you! Hi, may you drop me a contact number of your driver? me email is agnestania@gmail.com. thanks a lot. Hi, can you also share the contact details of the driver? My email is macbethlim@gmail.com. Thanks! Could u pls send me the contact of the driver? Hi, do you mind sending me the contact details of the driver? Thank you so much. Hi, may i have the contact of the driver? Hello. Please kindly send the contact of the driver.